The Lamp Shade Incident (a.k.a. Kit Creation, Part One) | Brew Hui. I’ve always naturally assumed that I’m handy. I firmly believe that as long as I plan for long enough and have the right tools, I can pretty much do anything that anyone with years of training can do – and get it right first time. Kinda like that scene in The Matrix when Trinity just sorta-downloads the ability to fly a helicopter – and is instantly awesome at it. But pride is, of course, greatest before the fall. sixty-three kinda-stab-shaped holes in a broken lamp shade. Events like The Lamp Shade Incident help to remind me (well, mainly my wife) that perhaps – just perhaps – there are limits to my DIY superpowers. Oddly-enough, I’m exceedinlgy proud of my over-inflated sense of DIY ability. For those of us who keep coming up with stupid ambitious ideas for new projects, the ability to irrationally think ‘Hey, I Could Do That!’ is a critical inertia-busting quality – particularly if you ever want to see one of those ideas become a reality. Filmmaker Kevin Smith calls this an embracement of a ‘Reasonable Amount of Unreasonability’ – and he’s the guy who made the indie-hit Clerks for Twenty-Seven Grand. It’s a good thing that I’m quick to embrace unreasonability – ‘cos if I’m going to create an all-grain brewing kit within my allotted budget, I’m going to need to be pret-ty unreasonable. With accumulated Birthday, Christmas and Father’s Day (yes, that far back) presents, I’ve got a grand total of $400 to spend. Four Hundred Bucks. That might sound like a lot of money – but once you realise how many moving parts are in even a basic all-grain brewing kit, you quickly find that Four-Spot doesn’t stretch too far. Like all of my utterly-unreasonable DIY projects, this one has started with a not-insignificant amount of planning. 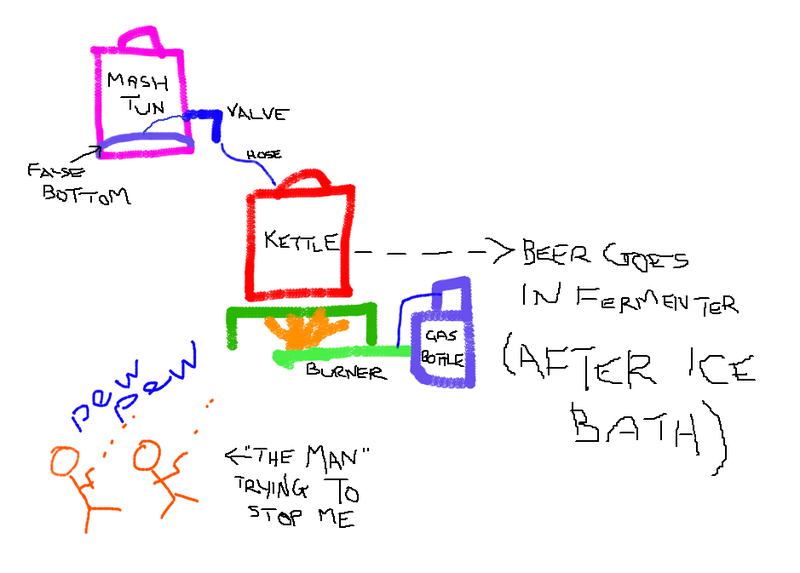 With the assistance of the interweb and this exceptionally helpful podcast from Radio NZ and Stu McKinlay, I’ve thought-through more-or-less every permutation of a within-my-grasp brewing setup – i.e. what needs to go where, and importantly which components can perform more than one function (an essential consideration for those on a budget). And after all this thinking, I’ve finally arrived at the best bang-for-buck kit that I can muster. Okay, perhaps it’s a stinking rather than stonking blueprint – but at least I’ve got the general principals down on paper. Well, touchscreen anyway. Pathetic-drawing-ability (and schematic vagueness) aside, I genuinely have great faith that the setup will work; ‘cos if there’s one thing I’ve learnt from trolling the interweb (and watching a kajillion YouTube videos), it’s that all-grain brewing setups are almost as unique as fingerprints. There are commonalities, sure; but when it comes to extracting fermentable sugars from grain, then boiling and fermenting the resulting liquid, there’s just simply more than one way to skin a cat. And that gives me great hope, since it suggests that the collaborative beers produced during this project – on a kit built by some moron who once stabbed a lamp shade sixty-three times because he couldn’t solder it back together – might actually stand-up to beer made on far-superior kits. So not going for BIAB to keep costs down then? I thought long-and-hard about BIAB (it seems like a very nice option for the noob homebrewer, i.e. moi), but eventually decided to skip the step and dive in the deep end…which isn’t to say that BIAB is the shallow end! P.S. Just saw your own choice homebrewing blog (http://churbru.blogspot.co.nz/) ! You’ve kept that one quiet! I sense a blog crossover in our future…like when David Brent appeared on the US Office (except less shark-jumpy). I look at the space we live in and already with two fermenters I feel I am taking over. My move from kit brewing to all grain I suspect will involve BIAB (probably via extract brewing first). I have not yet moved in that direction as I don’t feel comfortable about the amount of water wasted for chilling the wort to pitching temperature – I am still trying to figure out a better solution than just an immersion chiller. Yes ChurBru has been kept on the down low as was not sure I would keep posting. Seem to have kept it up so might promote a bit more.